Having wrapped up the French pain sour-dough section from Local Breads, (well…all I could successfully make without a mixer) I decided to revisit an old friend… Jeffrey Hamelman’s Bread: A Baker’s Book of Techniques and Recipes. This is one of the first books I purchased when starting my obsession with sourdough breads. As I thumbed through my falling apart- stained- tattered and signed copy, it was like meeting an old friend you have not talked to in months! 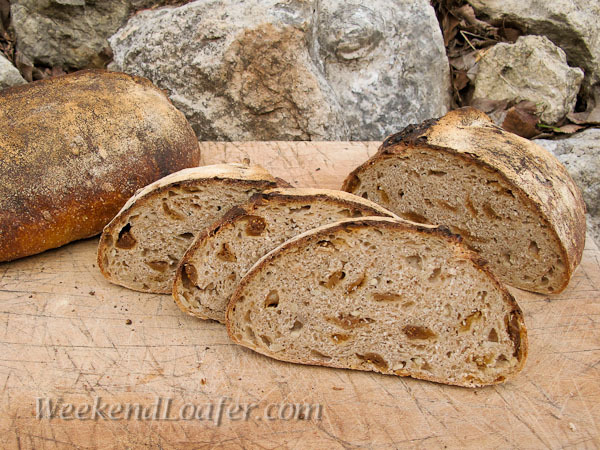 I became nostalgic as I looked at the many great recipes from the sourdough section; oh that Normandy Apple bread…what a great one, or Vermont Sour Dough… a classic, and the list goes on and on. To my surprise I then came upon a recipe that I never tried before! How is it possible I never baked the Whole Wheat Levain before? Deciding to give it a try, I converted my white liquid levain to whole wheat to get ready for a bake the next day. The preferment or levain for this bread is actually more like a polish (100% hydration) that uses the natural yeast instead of commercial yeast. Hamelman says “The protease enzyme degrades the flour protein, and is quite active in a liquid environment such as the loose- textured starter used here.” I mixed it up, turned on my micro processorto 73° and let it sit over night in the nice warm oven. After 12 hours it was filled with bubbles, active enzymes and ready to go. 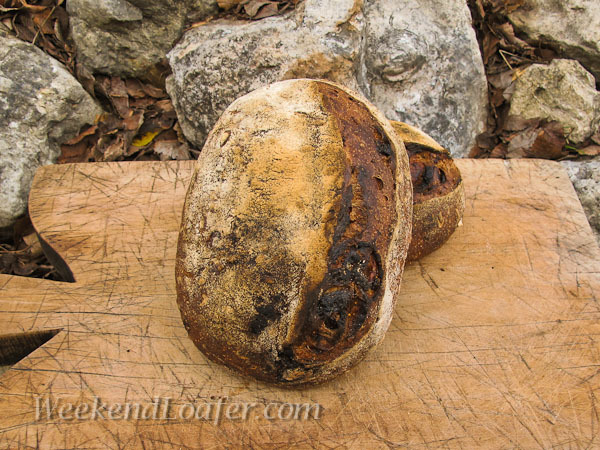 Living up on the mountain has made bread making an important part of my daily life. I usually try to keep lots of bread flour on hand, but for some reason I found very little left. So, with limited access to a market I had to make do with what I found in the pantry. Sometimes you have to be a very flexible and hope that the changes made will not totally mess up the bake. I made a few flour substitutions to the formula using what I had, added some sunflower seeds (really wish I had some hazelnuts instead) along with dried figs, and hoped for the best. The dough was a little sticky to begin with but came together after some vigorous French kneading. After observing a good gluten development, I worked in the sunflower seeds and chopped figs and gave it the full bulk fermentation with two folds. The rest of the process went like all of the recipes in the book I have baked; uneventful…which is a good thing! In the end I am sure glad I finally baked this bread…but sorry that I ran out of bread flour! For a bread with a good amount of whole wheat and all the extras I added the crumb was not too dense…in fact it had good volume. The addition of the figs and seeds is what really gives the bread an added taste dimension…the sweetness of the figs complements the earthy taste of the whole wheat. Loosely Adapted from Jeffrey Hamelman’s Bread: A Baker’s Book of Techniques and Recipes. Pour the water into a large mixing bowl or the bowl stand mixer. Combine the flours until all the ingredients (except salt) are incorporated. Cover and let it rest for 20 minutes, while the flour hydrates and the gluten begins to develop. If you are mixing by machine, you can wait to add the levain. I find it too messy to incorporate the liquid levain to the developing dough by hand. Kneading By hand: Turn the dough out onto your work surface. With floured or oiled hands knead a few strokes to start developing the dough, flatten out the dough, evenly disperse the salt and continue kneading for 12 to 15 minutes. I use a combination of the French kneading technique and the shown here if the dough is really wet to start (video clips). For the first couple of minutes it will be a sticky mess on your work surface, but do not yield to the temptation of adding more flour. Stop occasionally and use your bench scraper to gather any stray dough from your work surface. Continue until you have a good gluten development. You should be able to gently stretch a piece of the dough into a thin membrane that you can almost see through without it tearing. By machine: Add the salt and levain and mix on medium speed until the dough cleans up the bowl and you reach a good gluten development. Place the seeds on a towel to remove excess water. Knead the seeds and figs into the dough till evenly distributed. About one hour before baking, preheat the oven to 500°with baking stone and a tray in the bottom of the oven for steam. I like to add one cup of water or a hand full of ice cubes to the bottom tray a few minutes before putting the loaves in the oven to produce a moist environment for the baking of the proofed loaves. 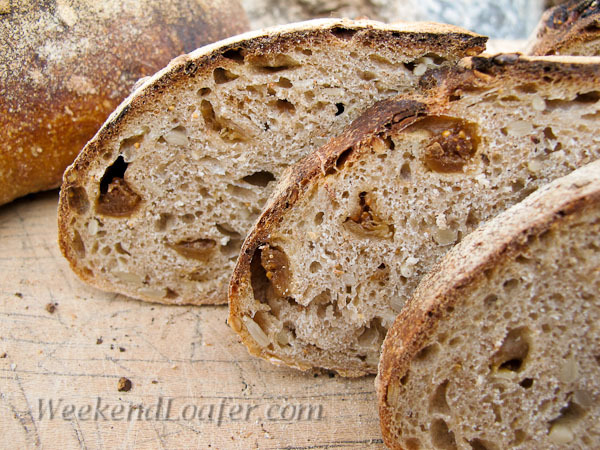 Gently turn the proofed loaves onto parchment paper or your floured peel. Score the loaves. Slide the loaves onto the baking stone, turn down the oven to 460° and continue to bake for 40-45 minutes. (I turn the oven down and then after 20 minutes, rotate them to get an even distribution of the heat and continue to bake until I have good color and when you tap the bottom of the loaf you hear a thud). I like to give the loaves a bold bake to help cook the interior loaf. Let cool on a wire rack before digging in.